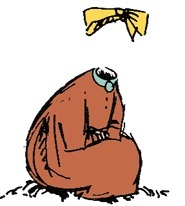 Ninny first appears in "Tales from Moominvalley" in the story, "The Invisible Child". Ninny is a real female first name, mostly used as a nickname, e.g. for Anna. She turned invisible by being frightened too much by her former caretaker. This caretaker gave Ninny to Too-ticky, who then brought her to Moominmama to help make Ninny visible again. Moominmamma succeeds with one of her granny's 'Infallible Household Remedies' and lots of love. Ninny at first is a bore and doesn't know how to play games or have fun. She becomes completely visible during a day on the beach. Moominpappa plans on sneaking up and scaring Moominmamma, but Ninny rushes up behind and shoves Moominpappa into the sea. In the end, the family realizes Ninny is very similar to Little My.